These are embroidered leather collars. The embroidery is done on thinner cowhide leathers that are put together and stitched onto thicker latigo or bridle straps of leather, and then lined in either suede or another strap of thinner leather. If your dog's neck size falls between two sizes, please make sure to choose the next size up, and we'll custom size your dog's collar accordingly. Please check out all the links below to help you decide on how to decorate your custom embroidered collar. Check out each link very carefully. Please note, when you choose a spot pattern, due to the nature of the name/phrase embroidered on the collar, and that it takes up space, the spot patterns WILL be modified to fit your collar. If you have any concern about this, please contact us for design details and/or leave a note in the design instructions box below in the menu. Make sure we have a valid email address to contact you at. If a design cannot be modified to fit your collar, we will contact you before making the collar. Got something custom in mind that you would like embroidered onto a collar? Got an image you'd like put onto a collar? 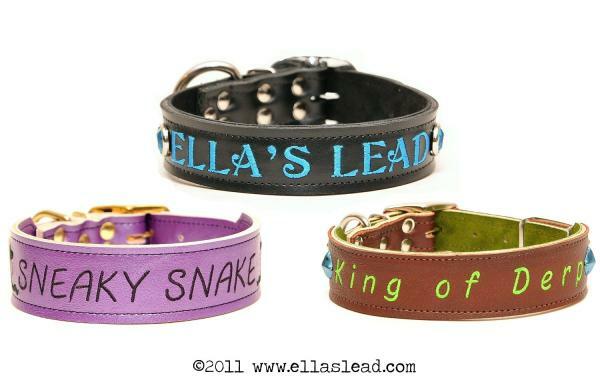 Check out our custom digitization page and contact us at orders@ellaslead.com for inquiry. Thank you!